Modern Event Rental is a full-service event rental company. 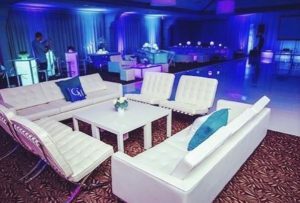 We offer unique event furniture rentals and event decor for any type of special event – nationwide. We began in our hometown of Chicago in 2009, in a 5,000 square foot studio, and have since grown into one of the top event rental companies in the country. We first started expanding throughout the Midwest, supporting events in the major cities of Indianapolis, Madison, Cleveland, and Detroit, and then grew to cities like Orlando, New Orleans, Nashville, and Memphis. Our design and fabrication studio is still located in Chicago, but we also have an office in Atlanta and distribution in Dallas and Houston. We can ship any item in our inventory to your event venue – no matter what city you’re in. At Modern Event, we believe in bringing your vision to life. Whether you’re planning a conference for 5,000 or a corporate event for 800, we will work with you to help you select the perfect event furniture and decor for your specific event. No event is too big or too elaborate for us. Customer service is our top priority and we want you to be completely satisfied with your experience. We fabricate, deliver, set up, and take down all event rentals in a timely and professional manner. We also have a 24-hour emergency number should our clients need to urgently get in touch with us. We provide a wide variety of event furniture rentals. 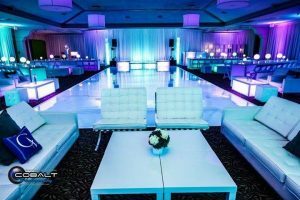 Some of our most popular items include LED furniture, custom stage sets, bar rentals, charging furniture, lounge & sofa rentals, and decorative wall panels. Our rentals are especially popular for trade shows, corporate events, conferences, and meetings. Many of our items can be used together to create unique and innovative displays that are sure to attract attendees. Looking for designer event furniture without the designer price tag? Contact Modern Event Rental today to speak with one of our event professionals about your upcoming special event!